Soon to be demonstrated at IFSEC, the REDSCANRLS-2020I is an indoor sensor using a new generation of laser that provides a customisable ‘virtual’ wall or pen, with a detection area up to 20x20m. The laser scanner can analyse the size, location and speed of the encountered objects and can be set up to trigger only when a certain size of object is detected, or when a distance threshold has been reached. The accuracy and precision of the REDSCAN sensor RLS2020I makes it an ideal trigger for event-driven video surveillance systems, by driving cameras to pre-determined positions and ‘pointing’ to where the intrusion or presence occurs. Easy to set up using either a web browser or the dedicated REDSCAN Manager software, the laser sensor is also integrated with most VMS platforms. 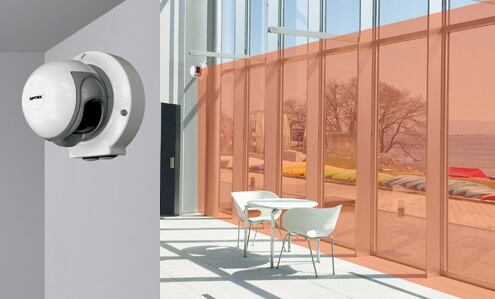 Compact, offering wall and ceiling mounting options, the RLS2020I laser sensor can be custom-painted to blend perfectly with its indoor environment and protect areas or assets more discreetly.